Selling your Knoxville home is more complicated than just putting a sign up in the yard and listing your home on the MLS. And, that’s why your hire a Knoxville list agent to help you with the process. A great listing agent will be your greatest ally and resource when it comes to selling your home. 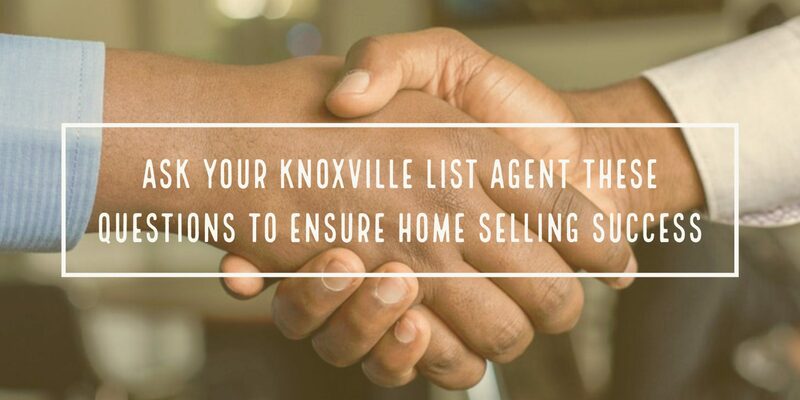 In order to determine if a Knoxville list agent is right for you, you’ll want to ask your Knoxville list agent these questions to ensure home selling success. A Knoxville list agent’s experience matters. You want someone with the knowledge, experience, and track record with selling homes in your area. Be sure to ask your list agent what kind of experience he or she has selling homes in your area. How many homes has that list agent sold in the area? What experience do they have? Do they have the local market knowledge? What have the experiences taught that list agent about selling homes in your area? These are all questions that matter when it comes to evaluating a list agent’s experience. A list agent has a critical role in selling your home. Who you decide to hire can determine how quickly you sell your home and what overall price you get. How Will You Make Sure My Home Is Marketed To Buyers? Marketing your home is essential in selling your Knoxville home. You want a list agent who has an arsenal of marketing tools to help sell your home. This is more than just sticking a sign in the yard, putting the home on the MLS, and crossing your fingers it sells quickly. Be sure to ask what the list agent will do to successfully market your home. What kind of marketing plan does the list agent have for your home? How has this marketing plan worked in the past? And, what does the list agent do that sets them apart from other agents? The way your home is marketed matters when you sell your home. A list agent is the one responsible for making sure that as many buyers gain access to your home as possible. So, be sure you hire the right one with a customized plan for you. One important thing you’ll talk with your list agent about is price. This is important for many reasons. For sellers, it can be interesting to hear what price a list agent recommends for your home. But, before you hire an agent just based on price, it can be important to hear the price and the reasoning. An experienced list agent will recommend a price based on what is for sale in your neighborhood and what has recently sold. Based on that information, your realtor will recommend a price for your property, taking into account any additional items your home may add value to your home. As a seller, it’s important to hear a list agent’s reasoning on the price they’re recommending. Many sellers can be irrational about pricing their home, so it’s important to hear the facts about what is selling in your area. If a list agent cannot support their price with facts, you should run the opposite direction. What Should I Expect During The Process? A Knoxville list agent can also help you set clear expectations for the sale process. As a seller, having a clear understanding of the process can help ease your stress. A list agent should be able to help answer you questions about the process. How long are most homes staying on the market? How will you know how showing went? How will you be contacted about showing? And, at what point would you need to re-evaluate price? It’s important to have clear expectations. This question will show you how a list agent operates during the selling process. A list agent should outline how they will communicate with you during the process and what you should expect along the way. Are you thinking about selling your Knoxville home this year? Are you unsure of where to start? We’ve helped countless Knoxville homeowners successfully sell their home and we’d love to help you do the same. You can contact Rick at 865-696-9002 or via email at Rick@KnoxvilleHomeTeam.Com. Or, you can contact Kati at 865-696-1888 or via email at Kati@KnoxvilleHomeTeam.Com.